"Get to work ya wretches!" barked the overseer as he gunned the engine on his chainblade. The half-witted slaves continued working, too simple to understand the overseer's orders. Nor did he expect them to. As the only one who's brain was not surgically altered, his shouts were to help his own anger at the lack of progress because he knew his neck was on the line if the slaves did not complete their tasks to the Warsmith's liking. I've been collecting and painting Iron Warriors since the release of the Second Edition Codex: Chaos. 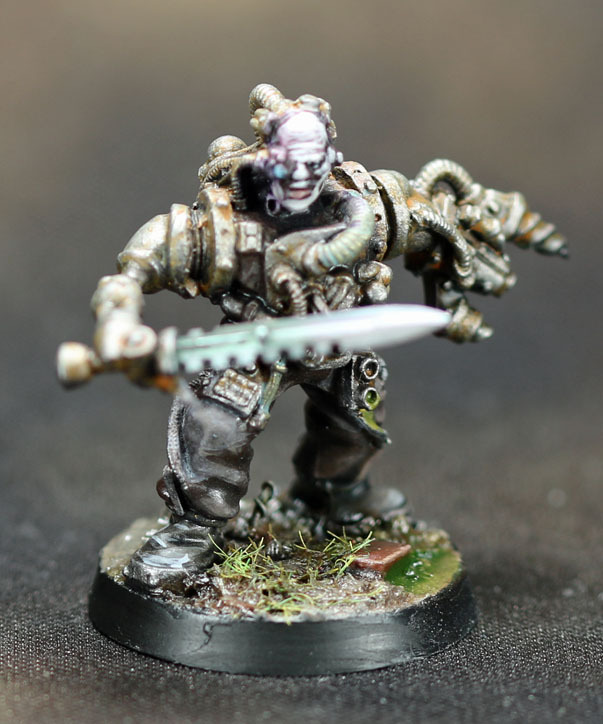 Even then, I never bought into the idea of the Iron Warriors having "cultists" the way that other legions might. They're not religious, so why would religious zealots flock to them? Sure, they may get a few that flock to their banner because they're chaos marines, but not in any substantial number because the Iron Warriors wouldn't cultivate them in the way that the Word Bearers or Emperor's Children would. Then I read "Dead Sky, Black Sun" and later the Night Lords series. And those reminded me that not all cultists need be worshipers, they can be slaves. Particularly, in Dead Sky, Black Sun, the Iron Warrior slaves were highly robiticized. 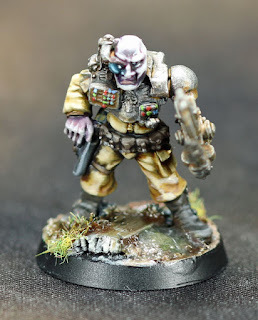 And more recent, the release of Kill Team pushed me into painting up some cultists. 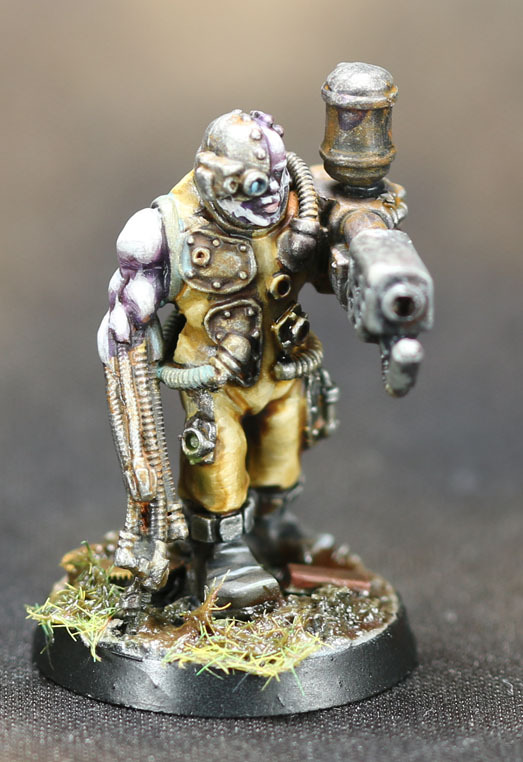 I had a bag of various servitors that would be great for conversion into Iron Warrior cultists--including a damaged Confrontation servitor. Since he still had some military dress, and with the addition of a chain arm, he became the overseer. 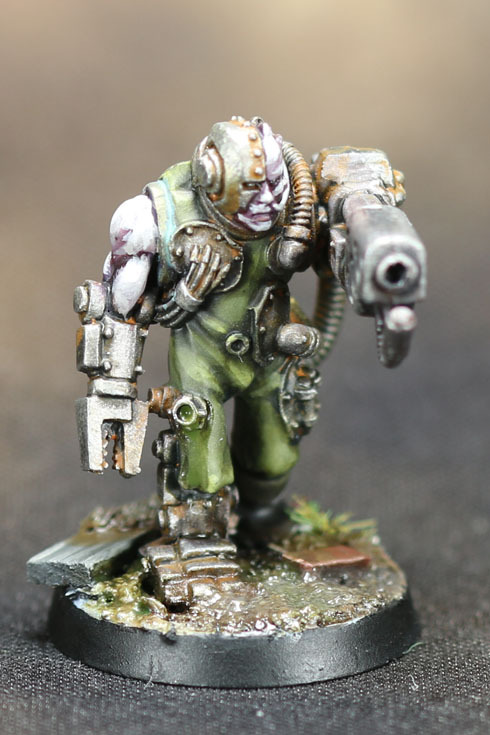 In fact, I think guy might also see double duty with some Rogue Trader Imperial Army! I also have quite a few Lead Adventure Miniatures Astropolis range. Ratnick is a great sculptor and this guy really fits in well. 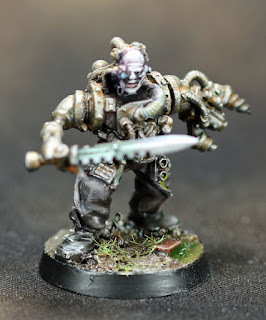 For a lot of the remaining servitors, I mixed in some modern Adeptus Mechanicus bits. 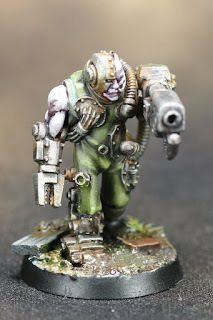 Particularly the Rust Stalkers, since they had some wicked looking close combat weapons. I also converted two up to carry flamers for a little ranged support. 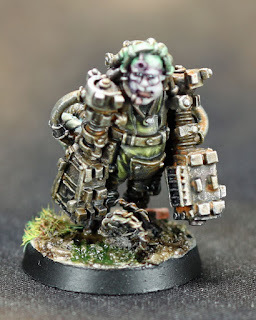 I figure that flamers would be equally useful for killing enemies and for performing the sort of manual labor that these slaves would also be forced to do. Painting was pretty straight forward. The flesh was based with Citadel Rakarth flesh and washed with Druci Violet, followed by mixing in Flayed One flesh into the base for the highlights. The metallics were Scale 75 Black Metal, highlighted by mixing in Speed Metal and finished with an enamel Rust wash from Ammo by Mig. Nothing too complex. The remainder were just various earth tones washed with Seraphim Sepia or Agrax Earthshade (as appropriate) and highlighted by mixing in P3 Menoth White Base. Thanks! I was attempting a Blanchian feel for them. These look fantastic!! I love the vibe, the way they look, how they all tell a story. Cool. Great. 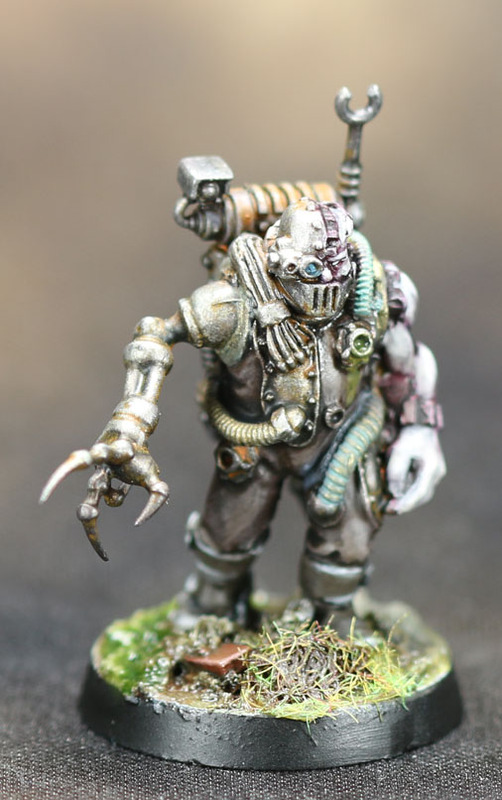 Was wondering whether you feel you can incorporate any tips from painting classes to this level of painting? Yes and no. Both the Banshee and Jérémie Bonamant Teboul classes I took were art classes, so there's a lot of concepts that, if you don't know already, do help.